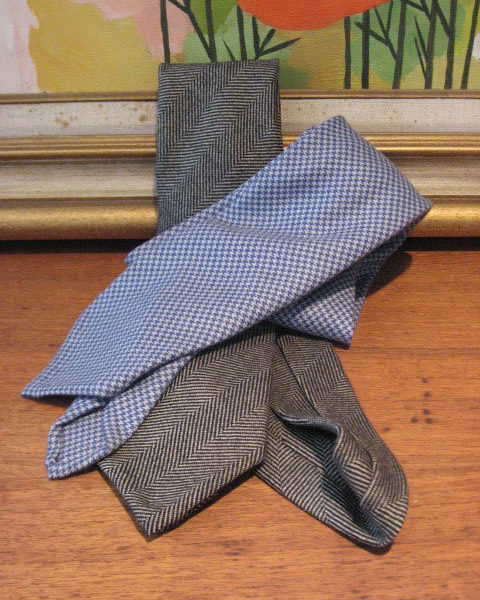 Ed, the proprietor of the tiny boutique clothing line Panta, based in New York, sent me two of his latest neckties today. I’m absolutely wowed by their quality. They’re heavy cashmere, and unlined, which gives them an unparalleled hand and a casual, slouchy feeling. This is perfect, of course, with the soft-shouldered Italian style that’s all the rage these days. The edges are hand-rolled, and I literally exclaimed an expletive when I touched the darn things, they’re so soft. Ed’s having a trunk show on Friday in New York City, if you’d like to check out and purchase his ties and trousers. Ties will be $99, and pants $199 (an extra $50 for cashmere). He’s promised me some pants when things settle down, and based on the evidence so far, I’m extremely excited about them. You can find Ed on Friday at 246 Fifth Avenue (just off Fifth) on the corner of 28th street, fifth floor, from noon to six. Just look for the stream of exceptionally well-dressed men.